Las Vegas (July 11, 2018) – Thursday, July 5, Mariah Carey, the iconic chanteuse and best-selling female artist of all time with over 200 million records sold, launched her all-new Las Vegas headlining residency, “The Butterfly Returns” at The Colosseum at Caesars Palace. Las Vegas (April 10, 2018) – Multi-platinum recording artist and global icon Gwen Stefani is heading to the Las Vegas Strip with her exclusive headlining residency show, “Gwen Stefani – Just a Girl,” inside Zappos Theater at Planet Hollywood Resort & Casino beginning Wednesday, June 27, 2018. LAS VEGAS (Feb. 26, 2018) – Zappos.com announced today that it is teaming up with Caesars Entertainment, beginning with the renaming of The AXIS, the Las Vegas resort’s world-class 7,000-seat state-of-the-art live entertainment venue. As part of the multi-year partnership, officials from both Zappos and Caesars revealed the theater will now be known as Zappos Theater at Planet Hollywood Resort & Casino. Additional initiatives will be announced in the near future. LAS VEGAS (Feb. 5, 2018) – Harrah’s Las Vegas has completed a $140 million transformation, which includes 1,622 modern new guest rooms and suites in its Valley Tower. Pairing seven-day-a-week free, live entertainment with a new lobby bar and casino floor, Harrah’s Las Vegas offers the best value at the center of the Strip. The new look comes as Harrah’s celebrates 80 years as a premier gaming brand. Las Vegas (Dec. 11, 2017) – The heat is on this winter as INFERNO, the fire spectacular that has taken Europe and Asia by storm, lands at Paris Las Vegas. A dazzling display of pyrotechnics, fire stunts and spectacular illusions, INFERNO has been called “a perfect show that surprises over and over again!” Performances begin at the Paris Theater on Jan. 24, 2018. Tickets are on sale now at Ticketmaster.com. LAS VEGAS (November 21, 2017) – Planet Hollywood Resort & Casino has completed a $100 million room renovation, pairing dynamic entertainment and dining offerings with 2,496 contemporary new guest rooms and suites. The renovation comes as the resort celebrates 10 years at the center of the Las Vegas Strip. August 9, 2017, Las Vegas, NV – Prepare to be transported into a world of water, wonder and fantasy as “WOW,” the internationally-acclaimed production, will make its North American debut with a splash at the Rio Showroom at Rio All-Suite Hotel & Casino in Las Vegas September 26, 2017. 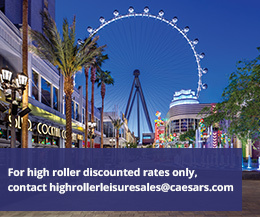 LAS VEGAS, NV – July 25, 2017 – Caesars Entertainment Corporation (NASDAQ: CZR) today announced that 25 of its affiliated resorts and three attractions have earned the prestigious 2017 TripAdvisor® Certificate of Excellence. Five more resorts were honored this year than in 2016. LAS VEGAS (July 13, 2017) -- Perfectly situated in the heart of all the energy and excitement of Las Vegas, The Cromwell remains the only standalone boutique hotel on the famous Strip. With impressive rooms and suites, dynamic gaming offerings, and distinctive cocktail, dining and nightlife options, The Cromwell adds to its allure with the introduction of a 24-hour casual eatery called eatwell, an updated Interlude bar and lounge, new high limit slot area, enhanced concierge technology, eKey technology, with an all-new Sportsbook expected to debut before September 1, 2017. LAS VEGAS (May 18, 2017) – Caesars Entertainment Corporation (NASDAQ:CZR) (“Caesars Entertainment”) today announced that, as part of its continued commitment to providing guests with the best possible experience, the company will be launching a $90 million complete renovation of 1,270 rooms at Flamingo Las Vegas. The renovation will begin in late August 2017, with the first guest arrivals expected in November 2017, and final completion of all rooms expected in the second quarter of 2018. LAS VEGAS (May 11, 2017) – Caesars Entertainment has added newly renovated suites to its most exclusive collection of luxury accommodations across its portfolio of Las Vegas resorts. 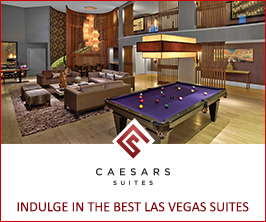 As part of Caesars Suites, formerly Anthology Suites, more than 2,000 suites and villas are available to view and book online via one comprehensive new website, www.CaesarsSuites.com. From the beginning of 2016 to the end of 2017, Caesars Entertainment Las Vegas will have renovated more than 800 suites, featuring a diverse array of options throughout the destination for every traveler and occasion. Select from sleek, multi-room suites to stylish two-story duplexes and grand villas spanning more than 11,000 square feet. Suite pricing starts at $175 per night.